Raleigh, NC (June 24, 2009) — Ford’s Gourmet Foods, purveyors of the internationally acclaimed line of Bone Suckin’ Sauces, today announced the introduction of a HOT version of their Seasoning & Rub and a sweet version of their Mustard. A cayenne kick is the perfect addition to the proprietary blend of brown sugar, paprika, garlic and spices in the original. This perfect combination of spicy, salty and sweet brings just the right amount of heat to this versatile new product. There are no jalapenos in this sweet combination of brown sugar, molasses and paprika, but you can expect the same great taste of the spicy original. Both the HOT Bone Suckin’ Seasoning & Rub and the Sweet Mustard are going to be introduced as part of the National Association for the Specialty Food Trade’s (NASFT) Summer Fancy Food show in New York City June 28, 2009 where they will be available for wholesale. Ford’s Gourmet Foods creates some of the world’s greatest tasting all-natural, gluten free foods including Wine Nuts and Fire Dancer Jalapeño Peanuts, Earth Family Organics and Naturals, and the internationally acclaimed Bone Suckin’ Sauces – the ONLY barbecue sauces rated #1 by Newsweek, Food & Wine and many others. A fourth generation, Raleigh, NC-based family business, Ford’s is known to make only the best. Poultry’s Recommended Internal Temperature: Is It Done yet? Looking to safely cook chicken or turkey, without having it come out dry and flavorless? The USDA says to cook until the juices of the wings and thighs run clear. The only way to do it is use a thermometer (see below), and remember the wings and thighs reach a higher temperature faster than the breast. Here are some simple guidelines for safe internal temperatures that will keep your poultry tasting great! All measurements are Fahrenheit. Whole Chicken or Turkey 180 degrees (thighs, wings & legs) / 160 – 165 degrees (breast) Note: This should occur at about the same time. It is important to remember that internal temperature will indeed rise a bit while “resting” off the grill. One universal tip is to watch for the juices to run clear but the best way to really know is by using an accurate instant read thermometer. You may already have an old dial faced version in your gadget drawer. In theory these are just fine and worked for many years; however I almost always find myself questioning the results. We prefer some of the really good digital instant read thermometer now available. In less than ten seconds you’ll really know what temperature you have. 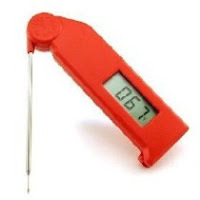 Cooks Illustrated spends a lot of time researching and testing the best of the best and when it comes to thermometers they suggest a model made by Thermapen for about $80 (based on pin-point accuracy and quick respnse time). But there are a few less expensive models. NOTE: If the thermometer you’re using needs to be “converted” from Fahrenheit to Celsius use this formula: Subtract 32 degrees from the (Fahrenheit) reading, then divide that number by 1.8. The result is the Celsius.